The electric mining drill mines out iron ore, copper ore, stone and/or coal, and places it in front of the output tile, on a belt or in a machine/chest that covers the output tile. The machine is 3×3, but mines in a 5×5 area, extending 1 tile away on each side. Mines copper ore, iron ore, coal, or stone at a rate of 0.5/s and uranium ore at a rate of 0.25/s. When placed over uranium ore, which requires sulfuric acid to mine, three fluid connectors will appear on the mining drill. The mining drills will pass excess sulfuric acid to each other when these connectors are aligned, allowing multiple drills to be placed right next to each other with only one pipe input necessary to feed all of them. Unified and rounded mining speed and times for ores and drills. Changed mining drill fluidbox to allow fluid to flow to pipes without the use of pumps. 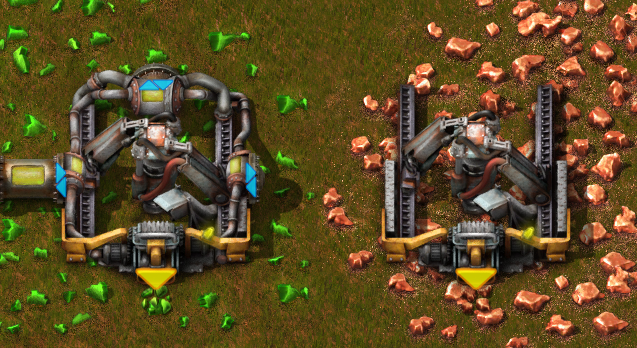 Mining drill now has fluid input when placed over uranium ore.
Mining drills can be turned on and off using the circuit network. They can also output the remaining expected resources. Mining drill now ignores resources that can't be mined because of the higher hardness. Shows area of effect when highlighted. Mining drill evenly mines from every tile in its area. Added support for modules to electric mining drills. Mining drills deactivate when out of resources. Show output arrows when alt mode is on. Shows count of available resources. This page was last edited on 12 March 2019, at 13:58.